PROJECT SUMMARY: This is a classic brick home tucked inside of one of Greensboro’s most desirable neighborhoods, New Irving Park. Southern Lights met with the owners and discussed several options front both the front and backyards. This home had unfortunately been neglected for several years between owners and after a lot of planning and discussion, our clients had our sister company Southern Exposure Landscape Management implement the landscaping transformation and utilize Southern Lights to bring the property to life at night with professional custom landscape lighting. Phase I, included landscaping and outdoor lighting for the front and sides of the home. The goal was to properly illuminate the front elevation of the home and potentially add onto the system down the road at a later date. During the design phase, Southern Lights provides the road map and detailed lighting designs for our clients, capturing beautiful settings at night, creating the most ideal landscape lighting effects. LANDSCAPE LIGHTING FOCUS: The home and its dark red brick exterior on the home were the main focus for the lighting. Illuminating the elevation changes at the front and street steps and along a stone walkway leading to the driveway were captured through beautiful Clarolux path lights creating safe passage at night. 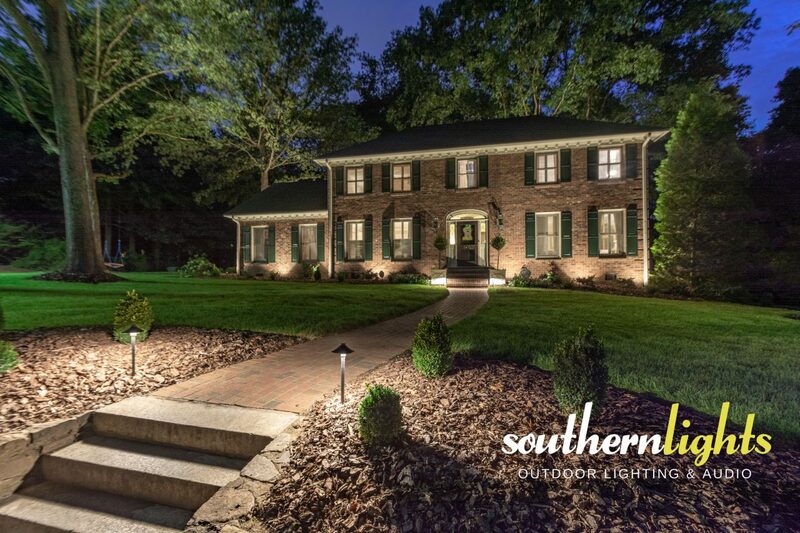 Southern Lights utilized 100% American Made LED lighting on this project. Also important to the homeowners, was the need to feel secure after daylight hours without the need to blast there floodlights all the time. They had unfortunately experienced a break in and were very concerned about safety lighting. Southern Lights was able to provide both the security the owner’s needed to feel on their property, and the serenity desired for a subtle accent lighting on and around the property. LOCATION: This custom landscape lighting design and installation can be found in the New Irving Park neighborhood, Greensboro, NC 27408. LANDSCAPE LIGHTING DESIGN: Ideal landscape lighting should evoke Safety. Security. SERENITY and should always start with a design. The home sits on a corner so exposure to three sides of the home are prevalent. Wrapping light consistently around the sides of the home was extremely important so that the entire property fit together and was cohesive. The brand new lawn and plantings now come alive with this classic brick home. HURDLES TO OVERCOME: Designing an ideal landscape lighting system takes planning. Getting light to the right place takes some skill and time to coordinate installing wire to the desired fixture location. Southern Lights was able to really take advantage of the construction being performed with the landscaping project, we were able to run wire and fixtures fairly easily. Proper planning was necessary for this custom landscape lighting project to run smoothly. This landscape is fairly mature, so getting fixtures where they needed to be for the right lighting effect, didn’t line up with the existing plant material. Southern Lights needed to add some extension riser poles to raise the height of the fixture in order to get the right effect. A night time visit was necessary to fine tune this lighting design. The upper eaves of this home also created a few installation intricacies. Again a riser pole was necessary and custom gutter mounts were utilized. Keeping the plant material properly pruned will be an ongoing maintenance need for these clients to keep the lighting design in tact for years to come and to reduce unnatural shadows on the architecture. This client ultimately trusted Southern Lights with the lighting designs allowing us to provide them with the most ideal landscape lighting effect with the best lighting fixtures for the space and structures. We think it turned out pretty awesome!